FFP and Latics – should Whelan splash the cash? Bournemouth has never had a team playing in the top tier of English football. They entered the Football League in 1923 and AFC Bournemouth play in a stadium that holds 11,700. They had 91% occupancy last season when they challenged for a playoff place, eventually finishing 10th in the Championship. Demin wants to see his club in the Premier League. In gaining promotion from League 1 in 2012-13 they lost £15.3m. He is clearly prepared to put in the funds to launch them up another division. Wigan Athletic fans know what it is like to have an owner who wanted to get his club into the Premier League. It cost Dave Whelan an awful lot of money not just to get Latics into the elite circles, but also to keep them there. If FFP had existed a decade ago it is highly unlikely that Wigan Athletic would have been able to climb up to the Premier League. In their final two seasons in the Premier League Latics were among a small minority of clubs that actually made a profit. After years of Whelan pumping money into the club it was starting to look like it could become self-sufficient. But relegation meant that the parameters changed – breaking even in the Championship was to be a very different proposition to doing the same in the Premier League. Last season Latics were due to receive £23m in parachute payments from the Premier League. With an historic Europa League campaign coming up the club decided to largely invest the parachute payments into maintaining a large squad. It is believed that the club had previously written into players’ contracts that their salaries would drop if they were to be relegated from the Premier League. Moreover a number of players left the club, several at the ends of their contracts, others for significant transfer fees. The proceeds from the sales of Arouna Kone and James McCarthy to Everton probably amounted to around £18m, although the payments were to be staggered over a time period. Most fans expected a sizeable chunk of that money to be reinvested in signing players who could help get the club back into the Premier League. Owen Coyle came in and did a remarkable job in bringing in 10 new players in the space of a couple of months, some having been at the ends of their contracts, some loan signings and others for what appeared to be bargain prices. With hindsight Coyle was to make one major blunder, paying around £2m for the 32 year old Grant Holt and giving him a 3 year contract. At the time Holt looked like a good signing, given his proven goal scoring record, although the length of the contract raised eyebrows at the time. However, Coyle paid modest fees to acquire Leon Barnett, Scott Carson and James Perch, who have proved to be good signings. He paid a little more to sign James McClean, who took a drop in pay to join Latics from Sunderland. Although the Irishman remains enigmatic he might well become a key player in the future. Coyle’s acquisition of Chris McCann, who had reached the end of his contract at Burnley, was by no means lauded at the time, but the Irishman was to prove a quality signing. Seven of Coyle’s signings remain Latics players, although Juan Carlos Garcia has gone to Tenerife on loan. The sum total of the transfer fees paid by Coyle would approximate to that received through the sale of Kone. It is assumed that the sum roughly equivalent to that due to be received through McCarthy’s transfer will be allocated towards the development of the new training and youth development facility at Charnock Richard. Latics actually performed relatively well last season in using their parachute payments to assemble a squad good enough to reach 5th place in the Championship. In the previous season the clubs who came down from the Premier League – Blackburn, Bolton and Wolves – finished in 13th, 16th and 18th positions, despite parachute payments of £16m. With the parachute payment and funds gained from the Europa League campaign, together with prudent financial management, it is likely that Wigan Athletic at least broke even financially last season. The projected cost of the Charnock Richard facility has not been announced by the club, although Latics clearly made a bargain in buying the site, which was auctioned at a guide price of £650,000. The accounts will make interesting reading when they are announced in a few months’ time. Under the current financial regime at the club, Wigan Athletic are highly unlikely to incur penalties under FFP rules. The challenge is whether they can secure promotion back to the Premier League against clubs who are spending millions on new players. Fulham’s investment of £13m on Ross McCormack was staggering, especially for a player who has never played in the Premier League. Last season both Leicester City and Queens Park Rangers flouted FFP rules in gaining promotion. The London team is reported to have had a budget of £70m last year, exceeding that of Atletico Madrid, La Liga winners and Champions League finalists. They lost £23.4m over the season. The rules for FFP for the Championship division differ from those of the Premier League and Leagues 1 and 2. For the 2013-14 season clubs were required to restrict any losses to £3m. However, it gave the owner of the club the option of converting up to £5m of any loss into equity, putting in cash to buy shares in the club. It cannot be done by borrowing money. However, if these were to be met and the losses did not exceed £8m there would be no penalty. Clubs are required to submit their accounts for the 2013-14 season on December 1st. Any club that exceeds the limit will have a transfer embargo imposed until it turns itself around to reach FFP rules. One club that appears certain to have a transfer embargo placed on it in January is Blackburn Rovers. They lost an incredible £36m in the 2013-14 season, wages alone accounting for 115% of revenue. The transfer of Jordan Rhodes for big money would help them to balance their books for the 2014-2015 season, but they face at least a year of transfer embargoes until the accounts are once more submitted in December 2015. The Football League has a “Fair Play” tax in the case of clubs who overspend, but are promoted to the Premier League. The tax is on a sliding scale, but QPR are due to pay over £17m on their overspending last year. The Championship clubs voted overwhelmingly to impose the Fair Play tax, but the implementation of the scheme relied on the support of the Premier League, which has not materialized. At this stage it looks like QPR have got away with it, but it remains to be seen what will happen if they get relegated and return to the Championship. Championship clubs continue to overspend in their ambitions to reach the Premier League, not only in transfer fees, but also in salaries. In the 2012-13 season only five clubs in the Championship made a profit. Leicester City lost £34m that season and if FFP rules had been in effect there is no way they would have avoided a transfer embargo, making it unlikely they would have been able to build up a squad strong enough for promotion the following season. It will be interesting to see if clubs fared any better last season, knowing that FFP was coming into effect. Almost half of the clubs in the Championship are receiving parachute payments. This gives them a considerable financial advantage over the others who receive a “solidarity payment“of £2.3 million from the Premier League, one tenth of that of a club in its first year of parachute payments. 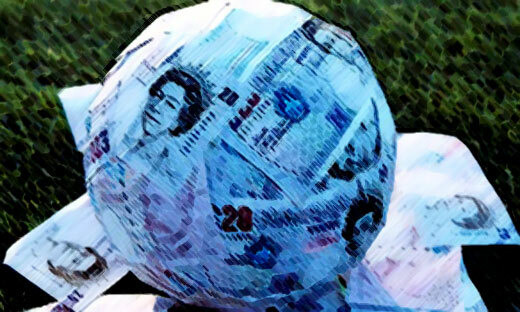 The imbalance among the clubs has led to suggestions that clubs with parachute payments should have TV money withheld and that a salary cap be introduced for clubs. Because of the financial support through the second parachute payment now is the time for Latics to really push for promotion. Over the next two years the payments will decrease and after that Latics would receive only the meagre consolidation payment that teams like Bournemouth are receiving. However, they are now competing against clubs who have just come down with bigger parachute payments plus other clubs who do not seem to be afraid to splash money on transfers despite FFP. Latics desperately need another striker who can win matches by scoring goals. The question is how far is Whelan willing to go in the bidding wars that start up as the transfer window deadline day draws closer? Brentford sources are suggesting that Latics are going to have to pay more for Adam Forshaw than we previously thought. Moreover a good central striker is going to cost money. Whelan will want to squeeze as much as he can out of any deal for James McArthur in order to finance the other two purchases. The hold-up in the Forshaw transfer might well be because Latics need to get the McArthur deal finalized first. There has been no news about other Latics players being sought by other clubs, but it remains a possibility at this late stage. Whelan, Jonathan Jackson and Uwe Rosler deserve credit for the way the club is being run on a sound financial basis. Looking at the plight of near neighbours Bolton and Blackburn highlights the fact. Latics are likely to be one of the leaders in the division in terms of meeting FFP conditions. However, whether Whelan will allow potential outgoings on transfers to exceed the incomings is a moot point. If he does not do so it will almost certainly jeopardise Latics’ chances of going up this year. Dave Whelan is first and foremost a businessman. He will have some key business decisions to make over the next few days. Nice article. Have to say Wigan have always seemed like a very well run club from the outside. Although you haven’t had the best start I have no doubts that your very talented manager (2nd only to our own Eddie Howe) will have you battling it out for promotion in no time. Also just to let you know, our chairman is called Jeff Mostyn, not Jeremy. Anyway good luck for the season.